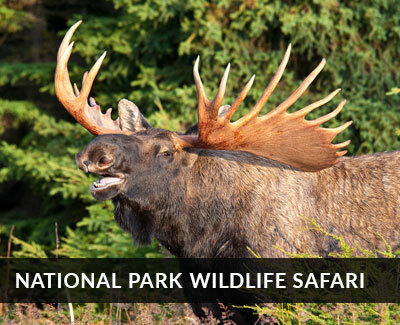 Our licensed guide staff is among the best in the state, combining enthusiasm, energy, and experience. We use only the finest equipment made, with Custom Willy Boat made "Predator" powerboats and drift boats, plus Fish Rite flat bottom sleds and Glacier Craft, Willy boat and Motion Marine offshore products. 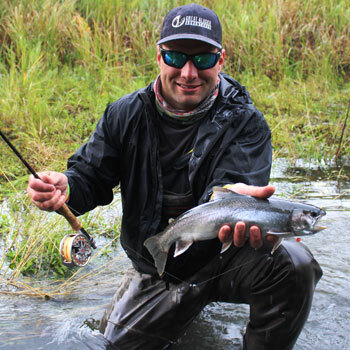 We also target these spectacular game fish with fly rods and have for nearly thirty years...Silver salmon are excellent game fish as they attack flies, bait and hardware with equal abandon. 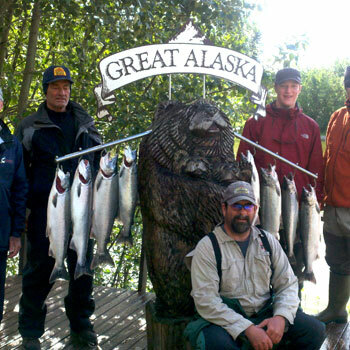 No one has caught more Silver salmon over the years than the guides and guests of Great Alaska Adventure lodge! 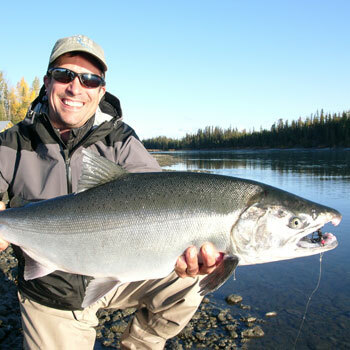 How do you fish the Kenai River? 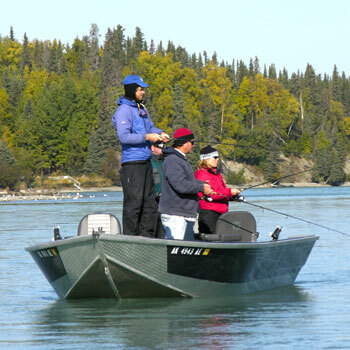 Our boats seat 4 anglers comfortably, with the guide either at the helm of the powerboat or at the oars in the Mackenzie River drift boat. 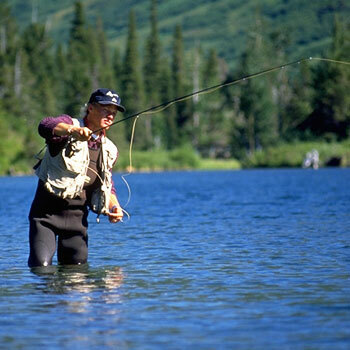 Techniques change daily based on a number of factors of course, but typically your guide will move from spot to spot, slowly backing downstream as you and your fellow anglers cast towards shore with lightweight spinning rods. We may be drifting gear, or picking spots and working the casts as we hold still or anchor. We also target the Silver Salmon with fly rods and jigs. Often, we'll travel up and down the river, seeking the fish and when we find a good group of fresh fish moving upstream the action will be sweet! Early season fish move upstream mostly during the morning and evening hours, so the mornings are especially exciting- however the fish can be notoriously unpredictable, and every strike is pulse quickening. Early season Kenai River Silver salmon fishing: In late July and early August, the early season Silver Salmon fish work their way up the southern beaches of the Kenai Peninsula, past the beaches of Homer and nearly a dozen small spawning tributaries, seeking the Mighty Kenai river and it's amazing spawning waters. 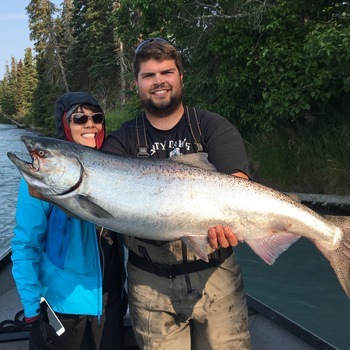 The earliest to arrive at the Kenai are a are usually caught while we fish for the large Kenai river King Salmon in the last weeks of July near tidewater. We don't begin to target the silvers with our spinning rods and fly rods until the first week of August. The August fishery is unique in that on even-numbered years, the crowd-pleasing Pink salmon or "humpback Salmon" (Latin name Oncorhynchus gorbuscha) join forces with the early Silvers to make for a simply unbelievable number of Salmon in the Kenai. The Sockeye salmon fishery is also outstanding, and they often peak around the 20th through the 30th of July, with tens of thousands of fish still entering the river the first week of August, often making the first week of August one of the hottest time of the year. Truly serious silver and trout fishermen sometimes prefer the later fall season or odd-numbered years (2007, 2009, 20011, etc) as the Pink run can be so numerous it can literally "blot out the sun" with fish. 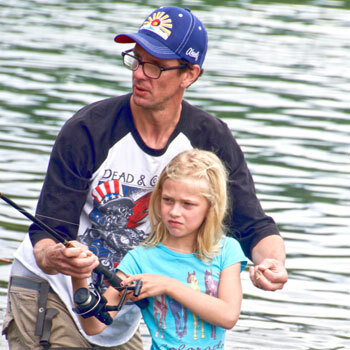 Kids, families and beginning fly fishermen love this time, however, as they can put a bend in their rods to the tune of a lifetime of fishing at home. Catches of over a hundred salmon per day per boat are very common and releasing 20 to 40 pinks per person to catch a limit of Silver salmon make for some really amazing days on the water. The early season is more unpredictable than the September fishery, but most any August date can provide great fishing with just a little luck. Sometimes our Silver Fishing guides are catching our guests limits on the 1st day of August, and other times due to tides and overall saltwater fish movement the silvers don't really begin to peak until around the end of the first week of August. In both August and September, Silver salmon fishing is generally done in either driftboats or Powerboats- either way we'll be casting spinners into shallow water holding or moving water for the explosive silvers...you guide walking you through the best spots to try, how to work the spinners most effectively and (sometimes) when to set the hook! This style of fishing is perfect for those who choose to release these great fish as without bait we usually hook the fish in the outside of their mounths and can easily release them unharmed. Silver salmon are notoriously fragile fish and rubber nets and careful handling is key. 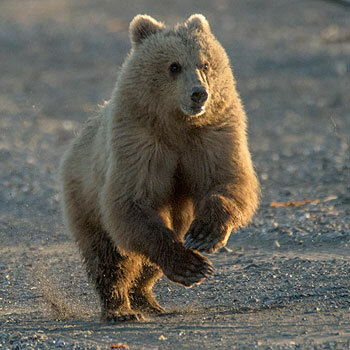 September Kenai River Silver salmon fishing is a different animal altogether! With the fish averaging 8-15 pounds, the larger September fish are stronger and better fighters. 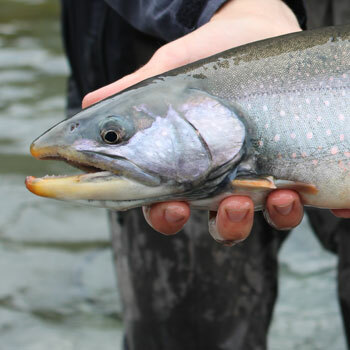 The cold days of fall combine big Rainbow Trout with the larger second run Silvers for a great "end of season" fishery. 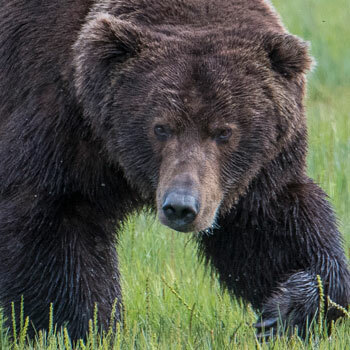 As the leaves change colors and begin to fall, and the bears begin to stalk the shoreline, the Silver Salmon fishery heats up and we have some of the finest fishing of the year. 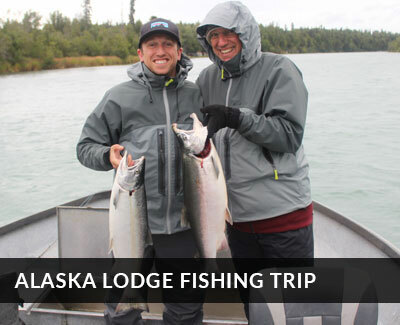 In addition to the fantastic Kenai River Silver Salmon fishing, many charters combine a few hours of drifting for trophy trout in the afternoons after the Silver Salmon bite has quieted down...making for some of the finest days of fishing to be had anywhere. Here you see anglers drifting the middle river for double digit rainbows while their limit of silvers wait in the box for processing at the end of the day! This is a great style of fishing that has our return guests coming back year after year after year....the Fall trophy Trout and Silver season is fantastic!